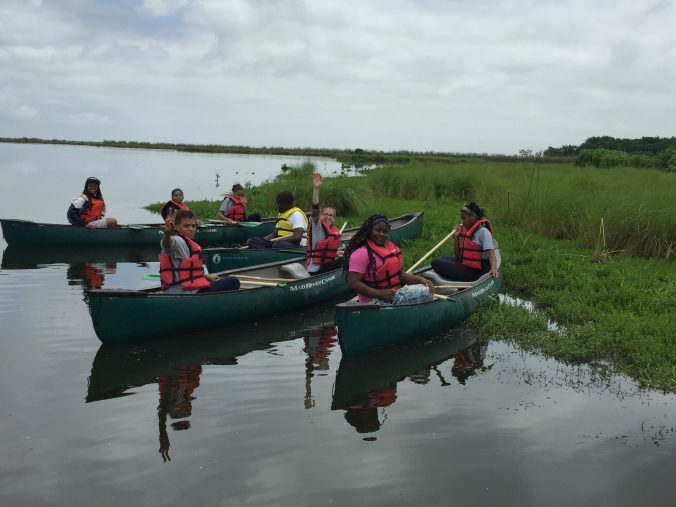 Students explore the wetlands by canoe. Capturing small fish and crustaceans with nets. Youth of all ages learn about wetland ecology. The Water Collaborative of Greater New Orleans and UNO’s Pontchartrain Institute for Environmental Sciences present hands-on educational outings for students and their families on Saturday, May 27, 9:30 a.m. – 1 p.m. This is a great opportunity for students who have studied water and wetlands in school to build on their studies with an immersive outdoor learning experience. RSVP now. Veteran educator Dinah Maygarden will lead a canoe outing to explore the dynamics of water movement in Chef Menteur Pass and the estuary’s connection to the Gulf of Mexico. After sampling small aquatic organisms that live in the wetlands and testing water quality, participants will discuss what makes a healthy ecosystem. There is no cost, but participants are responsible for their own transportation to and from the Shea Penland Coastal Education and Research Facility in East New Orleans. Please dress appropriately for outdoor activity, wear sunscreen and insect repellent, and bring water. You may also bring a picnic lunch to enjoy on the grounds after the outing. Participating students should be rising 5th graders or older and accompanied by an adult. One adult can bring multiple siblings or friends. Because space is limited, you must RSVP to secure your spot. Make the Water Collaborative part of your Give NOLA Day!